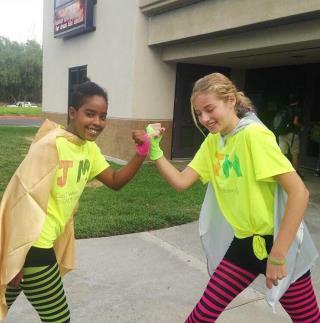 (Newser) – Two California 13-year-olds are the stars of Halloween this year with their joint costume: A superhero team they created called "The Juslims." As 13-year-old Casey Pearlman's father explained on Twitter Saturday, "My daughter is Jewish. Her best pal is Muslim. For Halloween they created a superhero team: The Juslims. I've rarely been more proud. Truly." The post has been liked more than 100,000 times and retweeted more than 50,000 times so far, with commenters seeming to agree that the girls and their costume are inspiring, BuzzFeed reports. They are so young but time will strip that away. Good luck to them in their futures. You know, they don't look Mewish at all. Cute kids. That's the American dream, right there.